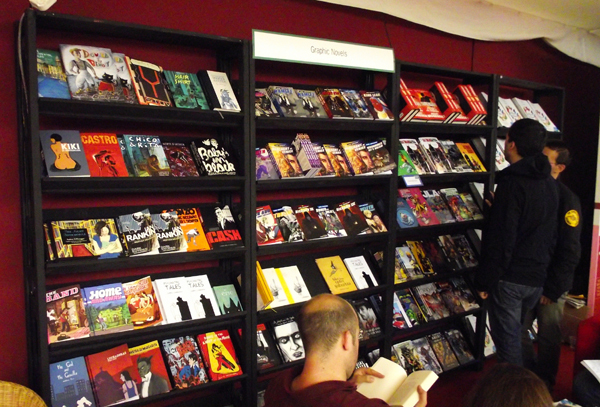 Huge thanks go to our friend Joe Gordon (of Forbidden Planet International fame) for sending us this picture of our books sitting pretty at this year’s Edinburgh Book Festival. What makes this picture so appealing to us is that you can now see exactly how integral literary/ alternative/ non-genre (whatever your chosen qualifier may be) comics have become within the graphic novel market in the UK, and the strides that publishers (including the esteemed SelfMadeHero and Jonathan Cape, both pictured) continue to make here. At the end of the day though, all of us owe our thanks to the readers of these fair lands for their continued impeccable taste, without which we’d all be committed to financial ruin. Thanks, guys! In other (more international) news: congratulations go out to all of the nominees for this year’s Ignatz awards, including Box Brown and Jon McNaught who both have work published by us later in the year. Box’s Chalk Marks release, The Survivalist, is currently slated for a December release and Jon is one of the 54-strong team of creators behind the UK comics mega narrative, Nelson, which will be setting sail in November. Great work, guys!